User Mode Driver - This is the main interface to the application. As detailed in the Compilation tools, after parsing and compiling the neural network layer by layer, the compiled output is stored in a file format called NVDLA Loadable. User mode runtime driver loads this loadable and submits inference jobs to the Kernel Mode Driver. Kernel Mode Driver - Consists of kernel mode driver and engine scheduler that does the work of scheduling the compiled network on NVDLA and programming the NVDLA registers to configure each functional block. The runtime environment uses the stored representation of the network saved as NVDLA Loadable image. From point of view of the NVDLA Loadable, each compiled “layer” in software is loadable on a functional block in the NVDLA implementation. Each layer includes information about its dependencies on other layers, the buffers that it uses for inputs and outputs in memory, and the specific configuration of each functional block used for its execution. Layers are linked together through a dependency graph, which the engine scheduler uses for scheduling layers. The format of an NVDLA Loadable is standardized across compiler implementations and UMD implementations. All implementations that comply with the NVDLA standard should be able to at least interpret any NVDLA Loadable image, even if the implementation may not have some features that are required to run inferencing using that loadable image. Both the User Mode Driver stack and the Kernel Mode Driver stack exist as defined APIs, and are expected to be wrapped with a system portability layer. Maintaining core implementations within a portability layer is expected to require relatively few changes. This expedites any effort that may be necessary to run the NVDLA software-stack on multiple platforms. With the appropriate portability layers in place, the same core implementations should compile as readily on both Linux and FreeRTOS. Similarly, on “headed” implementations that have a microcontroller closely coupled to NVDLA, the existence of the portability layer makes it possible to run the same kernel mode driver on that microcontroller as would have run on the main CPU in a “headless” implementation that had no such companion microcontroller. This is the interface for runtime library. It implements functions to process loadable buffer passed from application after reding it from file, allocate memory for tensors and intermediate buffers, prepare synchronization points and finally submit inference job to KMD. Inference job submitted to KMD is referred as DLA task. Get maximum number of device supported by HW configuration. 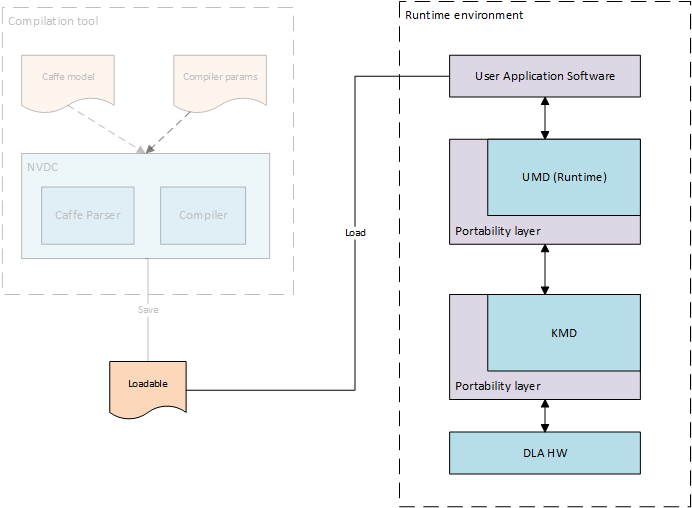 Runtime driver supports submitting inference jobs to multiple DLA devices. User application can select device to use. One task can’t splitted across devices but one task can be submitted to only one devices. Get number of available devices from the maximum number of devices supported by HW configuration. Allocate DMA memory accessible by NVDLA for input and output tensors. 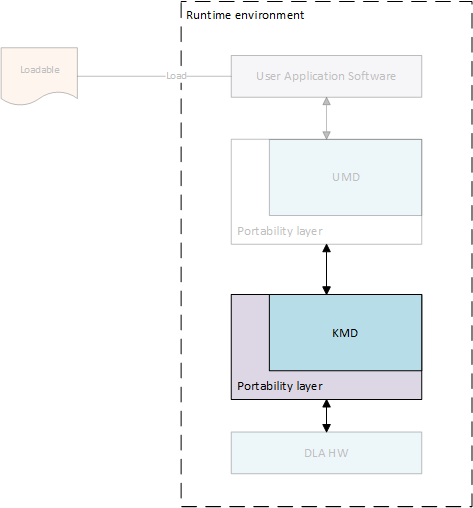 Portability layer for UMD implements functions to access NVDLA device, allocate DMA memory and submit task to low level driver. For this functionality UMD has to communicate with KMD and the communication interface is OS dependent. Portability layer abstracts this OS dependent interface. Memory heap to allocate memory, NVDLA supports two memory interfaces. Generally these interfaces are connected to DRAM (System memory) and internal SRAM. KMD can maintain separate heaps for allocation depending on memory type. Memory descriptor, it includes memory handle and buffer size. DLA task structure. Runtime driver populates it using information from loadable and is used by portability layer to submit inference task to KMD in an implementation define manner. This API should initialize session for portability layer which may include allocating some structure required to maintain information such such device context, file descriptors. This function can be empty. session_handle ([out]) – Pointer to update session handle address. This address is passed in any APIs called after this which can be used by portability layer to recover session information. This API should open DLA device instance. .
device_handle ([out]) – Pointer to update device context. It is used to obtain device information required for further callbacks which need device context. Allocate, pin and map DLA engine accessible memory. For example, in case of systems where DLA is behind IOMMU then this call should ensure that IOMMU mappings are created for this memory. In case of Linux, internal implementation can use readily available frameworks such as ION for this. pData – If the allocation and mapping is successful, provides a virtual address through which the memory buffer can be accessed. Outputs a message to the debugging console, if present. The KMD main entry point receives an inference job in memory, selects from multiple available jobs for execution (if on a multi-process system), and submits it to the core engine scheduler. This core engine scheduler is responsible for handling interrupts from NVDLA, scheduling layers on each individual functional block, and updating any dependencies based upon the completion of the layer. The scheduler uses information from the dependency graph to determine when subsequent layers are ready to be scheduled; this allows the compiler to decide scheduling of layers in an optimized way, and avoids performance differences from different implementations of the KMD. Neural networks are converted to hardware layers for execution on DLA hardware. 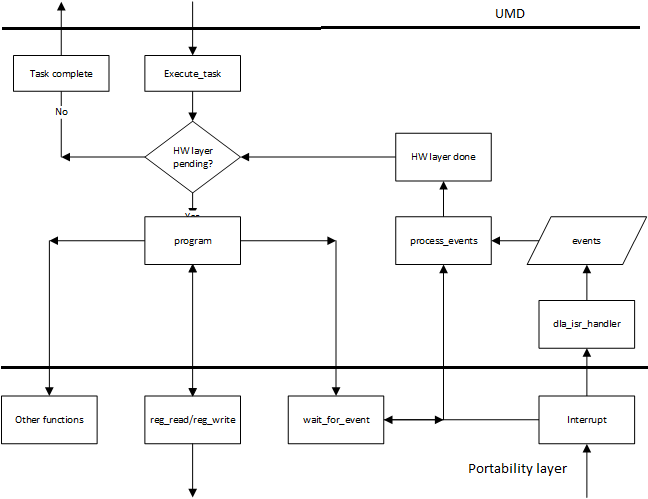 These layers are connected to each other using dependency graph and executed on DLA by module known as engine scheduler. This scheduler is responsible for updating dependency counts, handling events and programming hardware layers. It is the core module of DLA software and portable across different OS. Portability layer should use below interfaces to enable core engine module. Core engine module is also referenced as firmware as same source code would be used in firmware of companion controller for headed configs. This function must be called once during boot to initialize DLA engine scheduler and register driver with firmware before submitting any task. Pass pointer to driver context in @param driver_context which is passed as param when firmware calls any function of portability layer. It also updates pointer to engine context which must be passed in any function call to firmware after this point. Task descriptor structure. This structure includes all the information required to execute a network such as number of layers, dependency graph address etc. This function initializes sub-engines and starts task execution. Further programming and layer scheduling is triggered by events received from hardware. This function is called when DLA interrupt is received. Portability layer should register it’s own handler using the mechanism supported by that platform and call this function from the handler. Call to this function must be protected by lock to prevent handling interrupt when firmware is programming layers in process context. Interrupt handler just records events and does not process those events. Portability layer must call this function in thread/process context after interrupt handler is done. task_complete – Pointer to parameter to indicate task complete, firmare writes 1 to it if all layers are processed. This function resets engine scheduler state including op descriptor cache, error values, sub-engine status, events etc and clears previous task state from firmware. This function can be called by portability layer after task completion. It is not mandatory to call it but calling it will ensure clean state before next task execution. Core engine module (firmware) is OS independent but it still needs some OS services such as memory allocation, read/write IO registers, interrupt notifications. 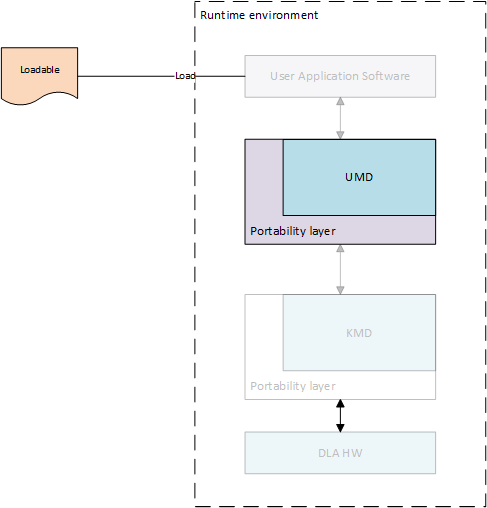 Portability layer implemented in KMD should provide implementation for below interfaces to core engine module. Read DLA HW register. Portability layer is responsible to use correct base address and for any IO mapping if required. Write DLA HW registr. Portability layer is responsible to use correct base address and for any IO mapping if required. Read DMA address from address list at index specified. This function is used by functional block programming operations to read address for DMA engines in functional blocks. Read CPU accessible address from address list at index specified. This function is used by engine scheduler to read data from memory buffer. Address returned by this function must be accessible by processor running engine scheduler. This function reads data from buffers passed by UMD in local memory. Addresses for buffers passed by are shared in address list and network descriptor contains index in address list for those buffers. Firmware reads this data from buffer shared by UMD into local buffer to consume the information. This function writes data from local buffer to buffer passed by UMD. Addresses for buffers passed by are shared in address list and network descriptor contains index in address list for those buffers. Firmware writes this data to buffer shared by UMD from local buffer to update the information. Memory will be accessed by processor running firmware. Some buffers shared by UMD are accessed by processor responsible for programming DLA HW. It would be companion micro-controller in case of headed config while main CPU in case of headless config. Also, some buffers are accessed by DLA DMA engines inside sub-engines. This function should return proper address accessible by destination user depending on config. Fills the first len bytes of the memory area pointed to by src with the constant byte ch.